12-year-old Abilene Tucker’s dad sends her back to his childhood town of Manifest for the summer while he works the railroads. Abilene is not too thrilled by the dullness of town, but things begin to look up when she discovers a hidden trove of trinkets and letters dated from 1917 and 1918. Through a “business agreement” with Miss Sadie, the local diviner, Abilene begins to unravel the story of two friends, Ned and Jinx, that took place over the years 1917-18, back when Manifest was a mining town that was tense with the mass diversity of immigrants arriving for work. But what do Ned and Jinx’s nearly 20-year-old story have to do with her? And why is her father never mentioned in any of Miss Sadie’s stories? 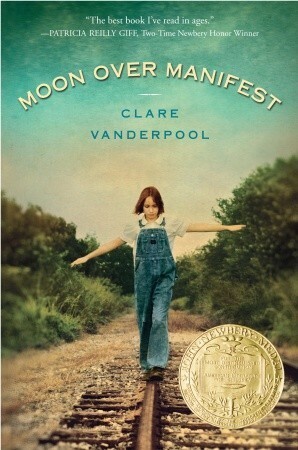 I wasn’t swept away by MOON OVER MANIFEST the way I want books, especially Newbery Award-winning ones, to do to me. In some ways, this is an odd book: the 1936 plotline mingles with the 1917-1918 plotline that’s told through stories, and for some reason or another I found the 1918 plotline so much more interesting than the 1936 plotline. I actually have to shake my head a little at how it’s possible for the 1936 plotline to be so dull. But there you have it: what could have been a charming plotline about Abilene Tucker arriving at Manifest, getting to know the town’s quirky residents, and digging into its secrets turned into a snoozefest in which Abilene runs around town with all the productivity of one of those annoying little dogs that always have so much energy and yet are so stupid, has placeholder conversations with the townspeople and eats their food, and purportedly has adventures with her two friends (whom I couldn’t pick out of a three-person lineup if I tried, they were so uncharacterized) without actually doing anything that was actually worth writing 350+ pages about. That was a bit harsh of me. I like clever books that surprise and outsmart me, and the revelation at MOON OVER MANIFEST’s ending did that, and even brought out some tears in me. However, under no circumstances can I wholeheartedly recommend a book just for its good ending if I felt the rest of it was just average. And, yeah, I felt MOON OVER MANIFEST was just average. It’s clever, the way the two storylines finally connected, but that’s not enough to overcome average characters and a slow plot. If I was inclined to put it down several times in the middle, how do you think a middle-grade audience would feel? I re-read this this year when I wrote a blog post on it--since people kept landing on my site with "who was the antagonist of moon over manifest", and I wanted to be of help. I liked this. It's at least a 4/5. I felt what made the book was the small-town setting, the ensemble, and how the author played with the medium. Admit it, there was at least some genius in how the newspaper columns were used to convey the story. Wow. I absolutely adored Moon or Manifest. Normally I prefer the Newbery Honor books more than the actually Newbery winners, but I loved this one. I did not find the 1930s part of the book dull at all, and I can't wait for Clare Vanderpool's next book. Sorry you didn't care for this one. Yeah...I've found this a few times with Newberry winners, which is always very disappointing to me. I think this sort of thing reflects the reality that it's not the MG readers that choose the Newberry winners, it's the adults--and that does create a disconnect whether or not we like to admit it. BBAW 2012: Pimp That Book! BBAW 2012: LEVEL 2 Giveaway! BBAW 2012 Interview Swap with Vy's Blog!